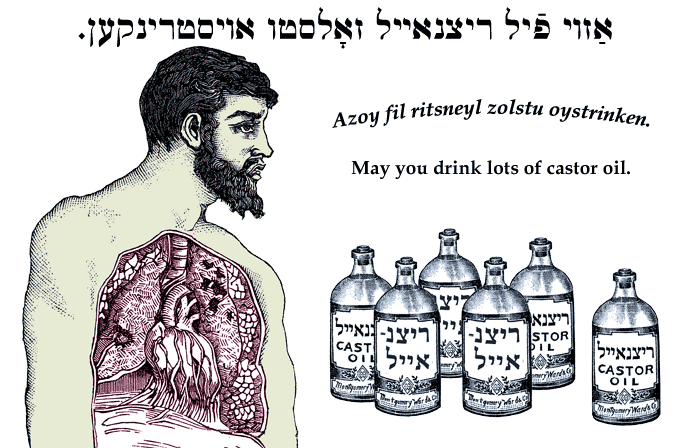 Yiddish Curse: May you drink lots of castor oil. אַזוי פֿיל ריצנאייל זאָלסטו אויסטרינקען. Azoy fil ritsneyl zolstu oystrinken. May you drink lots of castor oil. SOURCE: Stutchkoff, Der Oytser fun der Yidisher Shprakh. Castor oil is a traditional remedy for constipation.